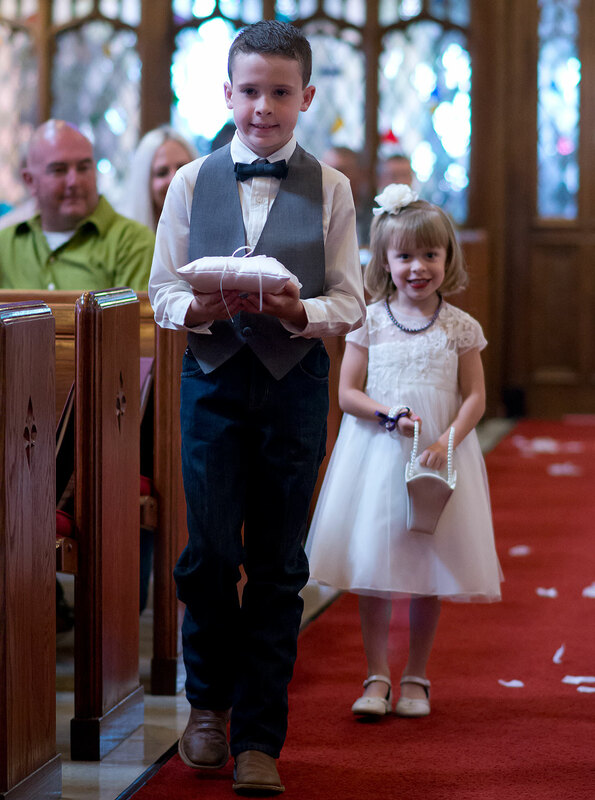 My young friend and former student Addi Manning Hudson got married two weeks ago and asked me to photograph the ceremonies. It was a beautiful day, with gorgeous light and a lovely ceremony. I made this prenuptial image with my AF-S Nikkor 85mm f/1.8. One key reason for shooting with the AF-S Nikkor 85mm f/1.8 is its large, bright maximum aperture. If you’ve ever shot an indoor wedding, you know how valuable it can be. I have been surprised in recent years by the number of professional photographers who have told me that they either hate shooting weddings, haven’t shot a wedding in years, or won’t shoot weddings at all. I will acknowledge that weddings can be crazy and stressful, but when I am asked, I will shoot them. It is also true that in recent years I am asked less and less, probably due to the perception that professional photographers cost too much, and that some uncle or friend with a “nice” camera can do it for $100. Nevertheless, I am asked to shoot weddings once in a while, mainly by friends and relatives who know me and trust me with creating images of a very significant moment in their lives. Overall I have been glad to do it, and have always had fun. I’ve tried various gear combinations, always centered around the same philosophy that governs my work as a news photographer: two cameras, one with a wide angle and one with a telephoto. 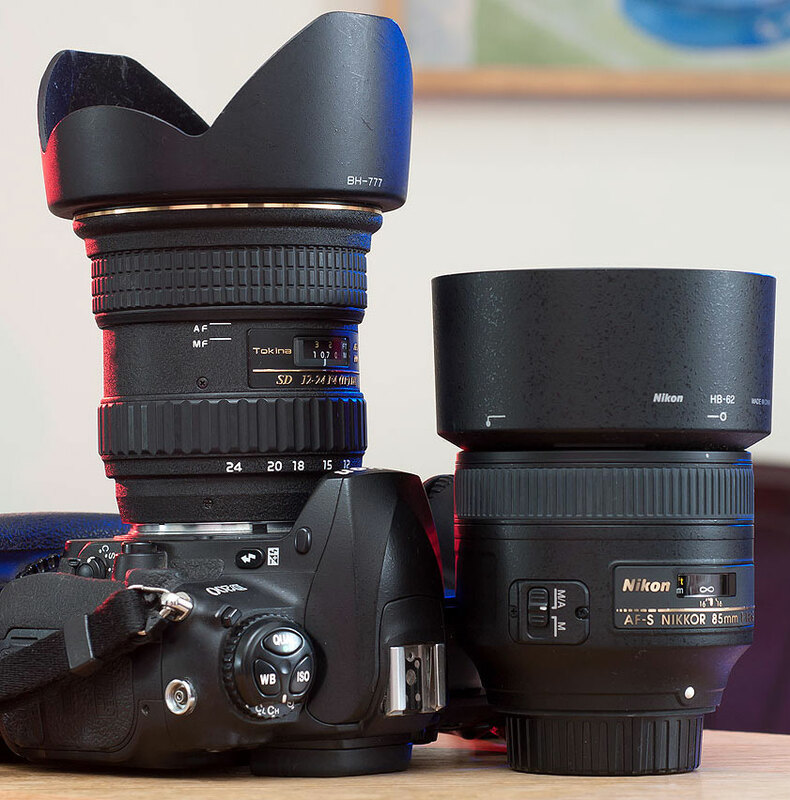 On the left is the Tokina 12-24mm f/4. Next to it is the excellent AF-S Nikkor 85mm f/1.8. For my sister’s wedding in 2011 I bought a Sigma 17-50mm f/2.8, but have been consistently disappointed by it, so for a wedding of a friend (and former student) two weeks ago I decided to go with one of my all-time favorite wide angle lenses, my Tokina 12-24mm f/4, on one camera, and my new AF-S Nikkor 85mm f/1.8 on the other. The combination is now without a doubt my go-to combination for weddings. I felt that I never missed a shot, was ready to both reach out with the 85 and go broad with the 12-24. I was very happy with the shoot and the hardware, and wouldn’t hesitate to recommend this combination for anyone who wanted to shoot weddings. 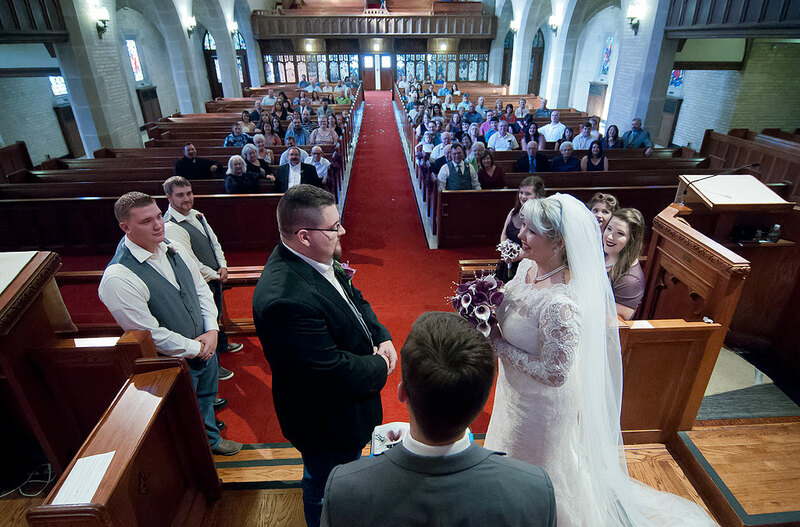 I stood on a chair and held my camera as far over my head as I could to get this overview of the ceremonies at Ada’s First United Methodist Church. It was made with my Tokina 12-24mm f/4. 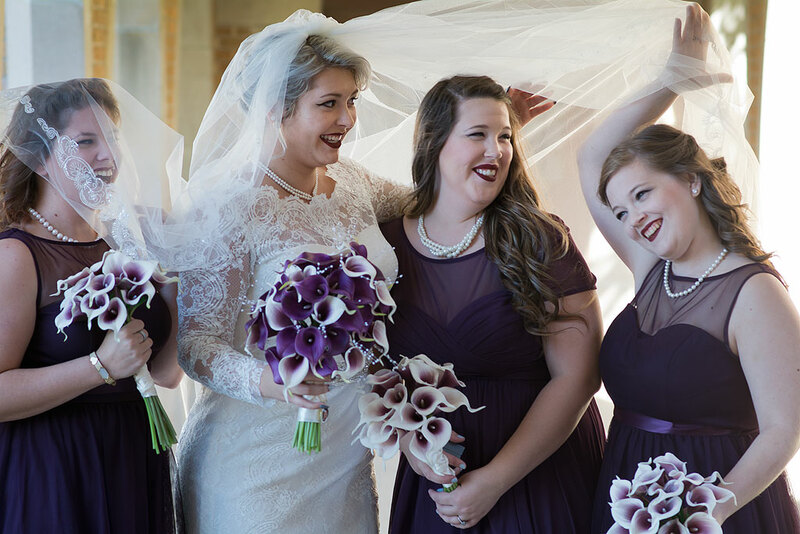 Christa and I have enjoyed shooting weddings thus far; as you say, it can be a little crazy and stressful, but I’ve had nothing but fun, both as the photographer and just as a spectator and witness to the ceremony. I mean, there are worse things to shoot. At both weddings we’ve covered, we’ve used our Nikon 85mm f/1.8, to beautiful effect – I mean, nothing else will do. I also used my Nikon 70-200mm f/2.8, which also produced images I was very satisfied with. We need to do more weddings!